PURE Pond Bomb. Have you tried it yet? Do you need an intensive, fast acting pond treatment? Do you need help achieving crystal clear, healthy water? 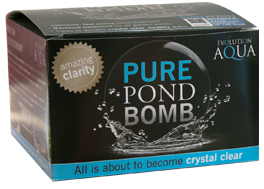 If yes, Evolution Aqua’s PURE Pond Bomb is the product for you. What is the PURE Pond Bomb? How to use the PURE Pond Bomb?